Your body has a symphony of hormones that work together to keep you sane and functioning at your best. 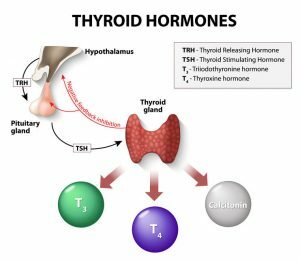 This post will focus on how the thyroid and insulin levels work together to keep the melody of your hormones rockin’. A tiny butter-fly shaped gland in your neck has a major impact on your weight, how you feel, and how well your body’s insulin works. This gland is called the thyroid. Working as part of the endocrine (or hormone) system, the thyroid produces two very important hormones. These are known as thyroxine (T4) and triiodothyronine (T3), produced from iodine found in the food we eat. The first step in thyroid function involves a part of the brain called the hypothalamus. The hypothalamus sends a signal to the pituitary gland through a hormone called thyrotropin-releasing hormone (TRH). This releases thyroid-stimulating hormone (TSH) to the thyroid gland (this is the hormone usually tested by your doc). Once TSH is received, the thyroid then creates and releases the two thyroid hormones T3 and T4. The pituitary gland is responsible for monitoring the thyroid hormones in the blood. It also regulating the amount of TSH that is released to keep these hormones balanced. Thyroid disorders are the second most common condition affecting the endocrine system, but often go undiagnosed. Hypothyroidism is the result of an underactive thyroid gland and is the most common disorder of the thyroid. This disorder appears to effect more women than men, with the onset typically occurring later in life. Hashimoto thyroiditis, an autoimmune condition, is the most common cause of hypothyroidism. Symptoms of hypothyroidism include cold intolerance, weight gain, fatigue, constipation, decreased heart rate, and fatigue. Hyperthyroidism, or having an overactive thyroid is less common than hypothyroidism. The disorder is nine times more common in women. The most common cause in people under the age of forty is an autoimmune condition known as Graves disease. The symptoms of hyperthyroidism are characterized by weight loss, heat intolerance, difficulty sleeping, mood swings, and increase heart rate. Insulin is a hormone produced in the pancreas responsible for regulating the amount of sugar in the blood. Insulin is often referred to as the “key” which unlocks a cell to enable sugar to enter to be used for energy. It is important because excess amounts of sugar in the blood can cause cell damage throughout the body. What is the relationship between thyroid hormones and insulin? Because thyroid hormones play an important role in glucose metabolism (converting sugar to energy), there is a strong relationship between thyroid hormones and insulin sensitivity. 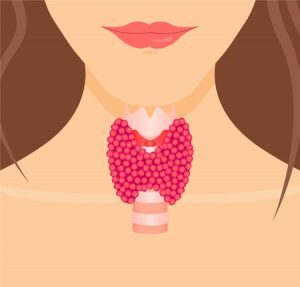 Hormones tend to have a cascading effect on one another, and your thyroid hormones are no different. Your blood sugar impacts your stress hormones, specifically cortisol, and those stress hormones impact your thyroid function. When eating more carbohydrates than your body actually needs, your blood sugar will increase. This in turn increases the amount of insulin your body produces. Eventually your body experiences “the crash,” low blood sugar with decreased energy and a craving for sweets or caffeine. When you’re experiencing low blood sugar, your cortisol level (stress hormone) also increases, which can impact your thyroid hormones. Too much cortisol suppresses the effect of TSH. This means the thyroid does not receive the signal to produce enough thyroid hormones. While not enough cortisol can decrease the amount of T3 your body produces. Insulin resistance, the body’s inability to respond to insulin, leads to an increase in insulin production that continues to fail to meet the body’s needs. The result is an increase in blood sugar which can lead to prediabetes and eventually type 2 diabetes. According to research, insulin resistance has been shown to cause significant changes in the thyroid gland. One study showed that both hyperthyroidism and hypothyroidism can affect blood sugar levels and eventually lead to insulin resistance. An excess of thyroid hormones can cause an increase in the glucose production in the liver and increased insulin resistance. If a person is experiencing unexplained weight loss and poor blood sugar control, this could be a sign of hyperthyroidism. Hypothyroidism typically doesn’t directly impact blood sugar control, but can reduce the clearance of insulin from the blood. This has been linked to decreased insulin sensitivity. 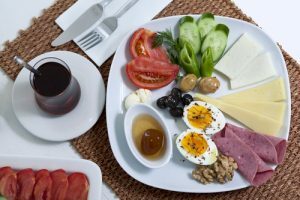 Recent research has found that low-thyroid function was a risk factor for the development of diabetes, particularly for people with prediabetes. Minimize intake of processed foods and excess sugar. Considering that high sugar and highly processed carbohydrates increase our need for insulin while increasing our blood sugar, choosing whole or real foods (with no or very small ingredient list) is recommended. Choose foods that are lower on the glycemic index. Lower glycemic index foods are slowly digested and absorbed causing a smaller rise in blood sugar levels. Eat the right types of fat. High quality fats from olive oil, coconut oil, avocados, nuts, seeds, and salmon help our bodies absorb vitamins and help to make hormones. Exercise can keep blood sugar levels steady while increasing insulin sensitivity. Not to mention all the stress reducing benefits. Sleep is a critical component of our lives and can help to maintain hormonal balances in the body particularly keep the stress hormone cortisol at bay. Have your thyroid hormones tested. The most common test is called the TSH (thyroid-stimulating hormone), but usually further testing of free T4, free T3, total T4, thyroperoxidase (TPO) antibodies, and thyroglobulin (TG) antibodies is necessary to get a full thyroid picture. Like all body systems, the endocrine system craves balance. Thyroid hormone balance goes hand in hand with insulin and blood sugar control. There is a tight range of thyroid hormone which maintains blood sugar and insulin at healthy levels, but just a little too much, or not enough can cause problems with insulin levels blood sugar control.